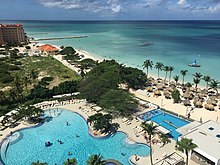 Aruba’s first inhabitants are thought to have been Caquetío Amerindians from the Arawak tribe, who migrated there from Venezuela to escape attacks by the Caribs. Fragments of the earliest known Indian settlements date back to 1000 AD. As sea currents made canoe travel to other Caribbean islands difficult, Caquetio culture remained more closely associated with that of mainland South America. Europeans first learned of Aruba following the explorations for Spain by Amerigo Vespucci and Alonso de Ojeda in the summer of 1499. Both described Aruba as an “island of giants”, remarking on the comparatively large stature of the native Caquetíos compared to Europeans. Gold was not discovered on Aruba for another 300 years. Vespucci returned to Spain with stocks of cotton and brazilwood from the island and described houses built into the ocean. Vespucci and Ojeda’s tales spurred interest in Aruba, and Spaniards soon colonized the island. Aruba was colonized by Spain for over a century. Simas, the Cacique, or chief, in Aruba, welcomed the first Catholic priests in Aruba, who gave him a wooden cross as a gift. In 1508, the Spanish Crown appointed Alonso de Ojeda as its first Governor of Aruba, as part of Nueva Andalucía. Arawaks spoke the “broken Spanish” which their ancestors had learned on Hispaniola. The Netherlands seized Aruba from Spain in 1636 in the course of the Thirty Years’ War. Since 1636, Aruba has been under Dutch administration, initially governed by Peter Stuyvesant, later appointed to New Amsterdam (New York City). 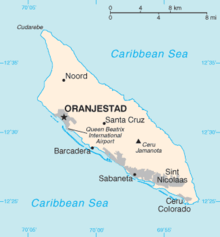 Stuyvesant was on a special mission in Aruba in November and December 1642. The island was included under the Dutch West India Company (W.I.C.) administration, as “New Netherland and Curaçao”, from 1648 to 1664. In 1667 the Dutch administration appointed an Irishman as “Commandeur” in Aruba. The Dutch took control 135 years after the Spanish, leaving the Arawaks to farm and graze livestock, and used the island as a source of meat for other Dutch possessions in the Caribbean. Aruba’s proximity to South America resulted in interaction with cultures of the coastal areas more than a century after independence of Netherlands from Spain; architectural similarities can be seen between the 19th-century parts of Oranjestad and the nearby Venezuelan city of Coro in Falcón State. Historically, Dutch was not widely spoken on the island outside of colonial administration; its use increased in the late 19th and early 20th centuries. Students on Curaçao, Aruba, and Bonaire were taught predominantly in Spanish until the late 18th century, when the British took Curaçao, Aruba, and Bonaire. Teaching of Spanish was restored when Dutch rule resumed in 1815. Also, efforts were made to introduce bilingual popular education in Dutch and Papiamentu in the late 19th century. In August 1947, Aruba presented its first Staatsreglement (constitution), for Aruba’s status aparte as an autonomous state within the Kingdom of the Netherlands. By 1954, the Charter of the Kingdom of the Netherlands was established, providing a framework for relations between Aruba and the rest of the Kingdom. Croes worked in Aruba to inform and prepare the people of Aruba for independence. In 1976, he appointed a committee that chose the national flag and anthem, introducing them as symbols of Aruba’s sovereignty and independence. He set 1981 as a target date for independence. In March 1977, the first Referendum for Self Determination was held with the support of the United Nations; 82% of the participants voted for independence. The Island Government of Aruba assigned the Institute of Social Studies in The Hague to prepare a study for independence; it was titled Aruba en Onafhankelijkheid, achtergronden, modaliteiten en mogelijkheden; een rapport in eerste aanleg (Aruba and independence, backgrounds, modalities and opportunities; a preliminary report) (1978). 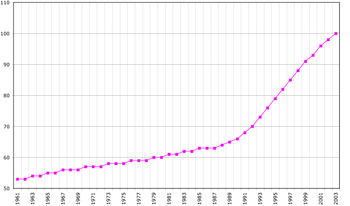 At the conference in The Hague in 1981, Aruba’s independence was set for the year 1991. After his death in 1986, Croes was proclaimed Libertador di Aruba. At a convention in The Hague in 1990, at the request of Aruba’s Prime Minister, the governments of Aruba, the Netherlands, and the Netherlands Antilles postponed indefinitely its transition to full independence. The article scheduling Aruba’s complete independence was rescinded in 1995, although the process could be revived after another referendum. Map of Aruba from the . The Natural Bridge was a large, naturally formed limestone bridge on the island’s north shore. It was a popular tourist destination until its collapse in 2005. Demographically, Aruba has felt the impact of its proximity to Venezuela. Many of Aruba’s families are descended from Venezuelan immigrants. There is a seasonal increase of Venezuelans living in second homes. As Aruba has a little proximity to Colombia, Colombian residents and their children are found here. In recent years, the government of Aruba has shown an increased interest in acknowledging the cultural and historical importance of its native language. Although spoken Papiamento is fairly similar among the several Papiamento-speaking islands, there is a big difference in written Papiamento. The orthography differs per island, with Aruba using etymological Papiamento, and Curaçao and Bonaire a phonetic Papiamentu. Some are more oriented towards Portuguese and use the equivalent spelling (e.g. “y” instead of “j”), where others are more oriented towards Dutch. Aruba is a polyglot society. Most of Aruba’s population is able to converse in at least two of the languages of Papiamentu, Dutch, English, and Spanish. As a constituent country of the Kingdom of the Netherlands, Aruba’s politics take place within a framework of a 21-member Parliament and an eight-member Cabinet. The governor of Aruba is appointed for a six-year term by the monarch, and the prime minister and deputy prime minister are elected by the Staten (Parliament) for four-year terms. The Staten is made up of 21 members elected by direct, popular vote to serve a four-year term. Aruba is an autonomous country in the Kingdom of the Netherlands, along with the Netherlands, Curaçao and Sint Maarten. Being members of the Kingdom of the Netherlands, they all share the Dutch nationality. However, Aruba is not a sovereign country as certain matters, such as defence and foreign affairs, are handled by the Netherlands. Aruba is designated as a member of the Overseas Countries and Territories (OCT) and is thus officially not a part of the European Union, though Aruba can and does receive support from the European Development Fund. The Aruban legal system is based on the Dutch model. In Aruba, legal jurisdiction lies with the Gerecht in Eerste Aanleg (Court of First Instance) on Aruba, the Gemeenschappelijk Hof van Justitie van Aruba, Curaçao, Sint Maarten en van Bonaire, Sint Eustatius en Saba (Joint Court of Justice of Aruba, Curaçao, Sint Maarten, and of Bonaire, Sint Eustatius and Saba) and the Hoge Raad der Nederlanden (Supreme Court of Justice of the Netherlands). The Korps Politie Aruba (Aruba Police Force) is the island’s law enforcement agency and operates district precincts in Oranjestad, Noord, San Nicolaas, and Santa Cruz, where it is headquartered. Deficit spending has been a staple in Aruba’s history, and modestly high inflation has been present as well. By 2006, the government’s debt had grown to 1.883 billion Aruban florins. Aruba received some development aid from the Dutch government each year through 2009, as part of a deal (signed as “Aruba’s Financial Independence”) in which the Netherlands gradually reduced its financial help to the island each successive year. Aruba’s educational system is patterned after the Dutch system of education. The island’s economy has been dominated by three main industries: tourism, aloe export, and petroleum refining (The Lago Oil and Transport Company and the Arend Petroleum Maatschappij Shell Co.). Before the “Status Aparte” (a separate completely autonomous country/state within the Kingdom), oil processing was the dominant industry in Aruba despite expansion of the tourism sector. Today, the influence of the oil processing business is minimal[further explanation needed]. The size of the agriculture and manufacturing sectors also remains minimal. Aloe was introduce to Aruba in 1840 but did not become a big export till 1890. Cornelius Eman founded Aruba Aloe Balm and the industry had become very important to the economy. At one point two thirds of the island was covered in Aloe Vera fields and the first plantation covered 150 acres and it is still used today at 127 years old. Aruba had become the largest exporter of aloe in the world, also because of Aruba’s climate and dry soil the aloe plants flourished and the aloin content was twenty two percent while the aloin content in the rest of the world was only as high as fifteen percent (arubablog.net) From this Aruba now has its own line of aloe and that contains skin care products, deodorant, sun care, shower and hair products (Aruba aloe). Defense on Aruba is the responsibility of the Kingdom of the Netherlands. 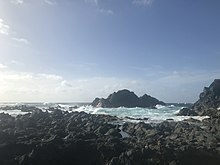 The Netherlands Military forces that protect Aruba include the Royal Netherlands Navy, the Netherlands Marine Corps and the Netherlands Coastguard. There is also a small indigenous “Arubaanse Militie” (ARUMIL) of about platoon strength. All forces are stationed at Marines Barracks Savaneta. Furthermore, in 1999 the U.S. Department of Defense established a Forward Operating Location (FOL) at the airport. Aruba has a varied culture. According to the Bureau Burgelijke Stand en Bevolkingsregister (BBSB), in 2005 there were ninety-two different nationalities living on the island. Dutch influence can still be seen, as in the celebration of “Sinterklaas” on 5 and 6 December and other national holidays like 27 April, when in Aruba and the rest of the Kingdom of the Netherlands the King’s birthday or “Dia di Rey” (Koningsdag) is celebrated. Christmas and New Year’s Eve are celebrated with the typical music and songs for gaitas for Christmas and the Dande[clarification needed] for New Year, and ayaca, ponche crema, ham, and other typical foods and drinks. Millions of florins worth of fireworks are burnt at midnight on New Year’s Eve. On 25 January, Betico Croes‘ birthday is celebrated. Dia di San Juan is celebrated on 24 June. Aruba’s Queen Beatrix International Airport is located near Oranjestad. According to the Aruba Airport Authority, almost 1.7 million travelers used the airport in 2005, 61% of whom were Americans. Water-en Energiebedrijf Aruba, N.V. (W.E.B.) produces potable industrial water at the world’s third largest desalination plant. Average daily consumption in Aruba is about 37,000 long tons (38,000 t). N.V. Elmar is the sole provider of electricity on the island of Aruba. There are two telecommunications providers: Setar, a government-based company and Digicel, both of which are privately owned. Setar is the provider of services such as internet, video conferencing, GSM wireless technology and land lines. Digicel is Setar’s competitor in wireless technology using the GSM platform. ^ a b c d “The World Factbook – Central Intelligence Agency”. cia.gov. Retrieved 25 August 2017. ^ a b “Aruba”. Encyclopædia Britannica. Retrieved 10 August 2014. ^ “History”. Visitaruba.com. Retrieved 23 March 2018. ^ “Sitios de Memoria de la Ruta del Esclavo en el Caribe Latino”. www.lacult.unesco.org. Retrieved 2019-03-04. ^ “British Empire: Caribbean: Aruba”. ^ “BBC News — Aruba profile — Timeline”. Bbc.co.uk. 5 November 2013. Retrieved 15 July 2014. ^ a b Canoe inc. (22 June 2011). “Aruba: the happy island”. Slam.canoe.ca. Retrieved 15 July 2014. ^ “Cities in Aruba – Guide to Aruba’s Biggest Cities”. Retrieved 2018-06-03. ^ a b “Climate Data Aruba”. Departamento Meteorologico Aruba. Retrieved 15 October 2012. ^ “Summary Climatological Normals 1981–2010” (PDF). Departamento Meteorologico Aruba. Retrieved 15 October 2012. ^ “About Us”. DutchCaribbeanLegalPortal.com. Retrieved 2014-05-20. ^ a b Central Intelligence Agency (2009). “Aruba”. The World Factbook. Archived from the original on 4 June 2011. Retrieved 6 June 2011. ^ “Political Stability”. Aruba Department of Foreign Affairs. Retrieved 7 June 2011. ^ “EU Relations with Aruba”. European Union. Archived from the original on 9 June 2011. Retrieved 6 June 2011. ^ “Overseas Countries and Territories (OCT)”. European Union. Retrieved 6 June 2011. ^ “Best Things to do in Aruba – Aruba.com”. www.aruba.com. Archived from the original on 15 February 2013. ^ “Korps Politie Aruba: district precincts”. Aruba Police Force. Retrieved 11 September 2010. ^ Central Bureau of Statistics. “Key Indicators General Government, 1997–2006”. Archived from the original on 22 July 2011. Retrieved 7 June 2011. ^ “Bogaerts: USA TODAY Sports’ Minor League Player of Year”. Usatoday.com. 3 September 2013. Retrieved 15 July 2014. ^ “Hands for Ziti: Teacher & Students from International School of Aruba Team Up to 3D Print e-NABLE Prosthetics | 3DPrint.com | The Voice of 3D Printing / Additive Manufacturing”. 3dprint.com. Retrieved 2018-09-15. ^ “Schakel College in Tilburg • Tilburgers.nl – Nieuws uit Tilburg”. Tilburgers.nl – Nieuws uit Tilburg (in Dutch). Retrieved 2018-09-15. ^ “Aureus University School of Medicine”. Aureusuniversity.com. Retrieved 25 August 2017. ^ “Caribbean Medical School – Xavier University”. Caribbean Medical School – Xavier University. Retrieved 25 August 2017. ^ “Convert Dollars to Aruba Florin | USD to AWG Currency Converter”. Currency.me.uk. Retrieved 15 July 2014. ^ “Convert United States Dollar to Aruban Florin | USD to AWG Currency Converter”. Themoneyconverter.com. Retrieved 15 July 2014. ^ “The World Factbook — Central Intelligence Agency”. Cia.gov. Retrieved 12 October 2016. ^ “Aruba”. HighEnd-traveller.com. 2016-05-31. Retrieved 2017-12-08. ^ “Aruba Foreign Affairs”. www.arubaforeignaffairs.com. ^ “Aruba Hosts International Desalination Conference 2007”. Aruba Tourism Authority. 18 July 2007. Archived from the original on 15 February 2013. Retrieved 13 May 2015. ^ “History”. W.E.B. Aruba NV. Archived from the original on 18 July 2011. Retrieved 7 June 2011. ^ “Setar N.V.” Setar N.V.
^ “Mio Wireless”. Archived from the original on 19 June 2014. ^ “Coral bridge, natural Aruba tourist spot, collapses”. USA Today. Associated Press. 2 September 2005. Retrieved 11 September 2010. ^ “Flamingo Beach”. Retrieved 5 April 2019.